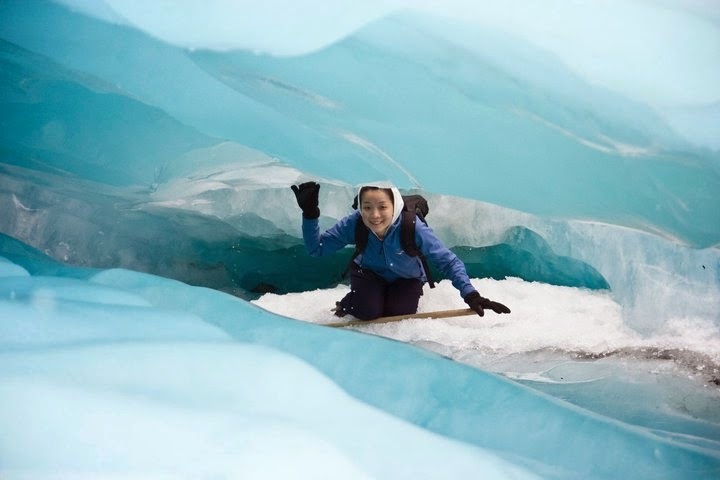 Fox Glacier is one of two of the best known glaciers of New Zealand, descending from the Main Divide at over 3000 m above sea level down to the temperate rain forest that graces the West Coast region of South Island. Like Franz Josef Glacier, its snout lies within easy reach of the main road, Highway 6 (more below photos). It is 35 km2 in area with an estimated mean depth approaching 100 metres. Positive mass balances (from increased snowfall) since the mid-1980s have resulted in several hundred metres of advance, except for brief recession at the turn of the century. Like Franz Josef Glacier the Fox responds rapidly to mass balance changes because of its wide accumulation area and steep narrow tongue. The dimensions of Franz Josef Glacier are 37 km2 in area with an estimated mean depth approaching 100 metres, very similar to Fox Glacier. 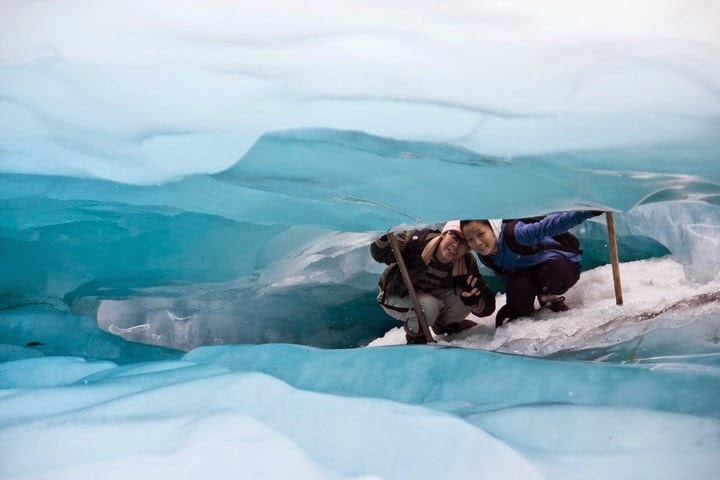 Its recent behaviour is also remarkably similar to the Fox Glacier, and positive mass balances (from increased snowfall) since the mid-1980s have resulted in a few hundred metres of advance, except for brief recession at the turn of the century. 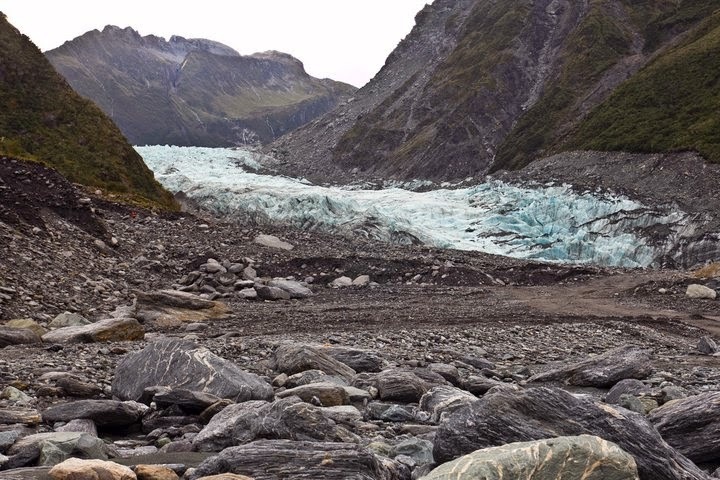 Franz Josef Glacier responds rapidly to mass balance changes because of its wide accumulation area and steep narrow tongue, again similar attributes to those of Fox Glacier. 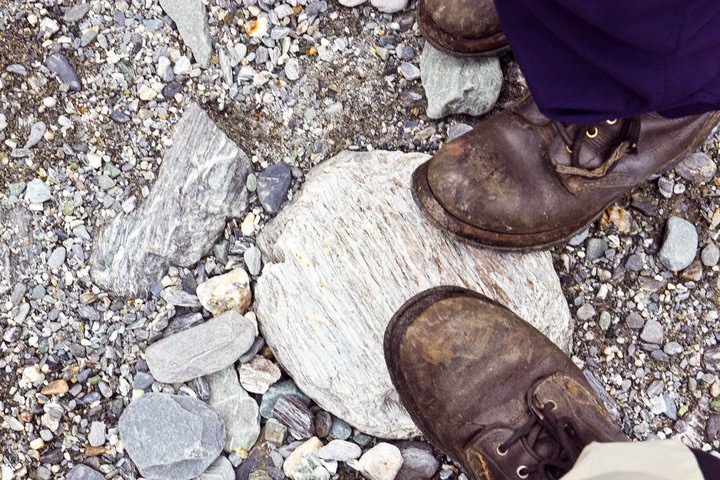 After the days in Wanaka, we were heading towards FOX and Franz Josef. The way from Wanaka to FOX is about 260km with 4 hours driving time with non-stop, I remember we spent about 5 hours to reach FOX, and we stayed in Franz Josef, from FOX to Franz Josef is about 23km with half and hour driving time. Unfortunately, the day was having a really bad weather with no sun, cloudy, windy and raining....originally, we planned to have some photography on the way to FOX and have some few stops there, but the weather said sorry to us, sad man. However, we saw at least 5 rainbows during our driving, I have been long long time did not see the rainbow, awesome!!! The way to FOX from Wanaka, actually have many scenic sceneries as the road is just near the lake and there are many stunning landscapes which we really cannot forget. Also, there are many waterfalls, big and small, water failing down from the top of mountain. The way is not really smooth, we drove slow as raining and many curves. Please bear in mind that do not drive with fast speed and not driving in the night as no light at all!!! The forecast weather is also need to be taken good care. Initially, we have booked the hiking at FOX which original start at about 2pm, we reached there about 12pm. However, unfortunately, the hiking trip was cancel because of raining caused the level of river raising to unsecured condition. 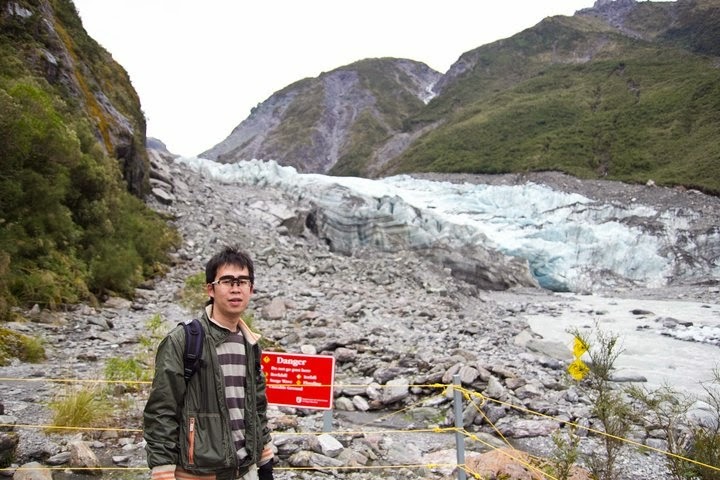 We were really disappointed at the moment as we were planing for this hiking for long time ago, and this is the must to see glacier in New Zealand. We were joining a half day tour, cost us NZ$99 per person. Refer the FOX website. Haha, fortunately, the weather was under perfect condition on the next day morning. We registered at the counter, the personel gave us the cloths, hiking shoes and a backpack. They will give you a briefing for the hiking before leaving to glacier, we gathered at the front door and the bus was getting ready for bringing us over the glacier destination. 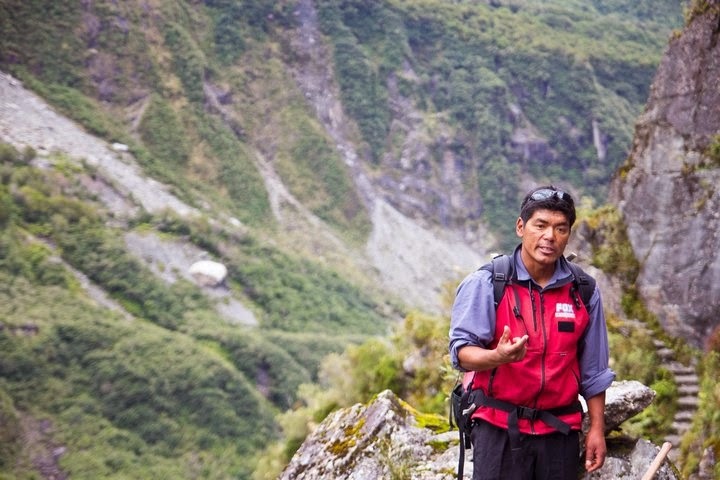 After arrive the glacier, the tour guide will guide us along the way to the higher destination, they will also provide a walking stick for ease hiking. Then he will bring you to few points for photography. Feeling quite cold at the starting as we haven't warmed up, after 10 minutes you will definitely feeling warm. The whole trip is about 3-4 hours. At the top of glacier is about an hour. FOX Glacier is really a great place to visit as you will not easy to find this stunning scenery in the world, I have a great experience here and would like to visit her again if I have chance. Compare to the Franz Josef, as my friends went there for full day tour and they had also a good experience there. 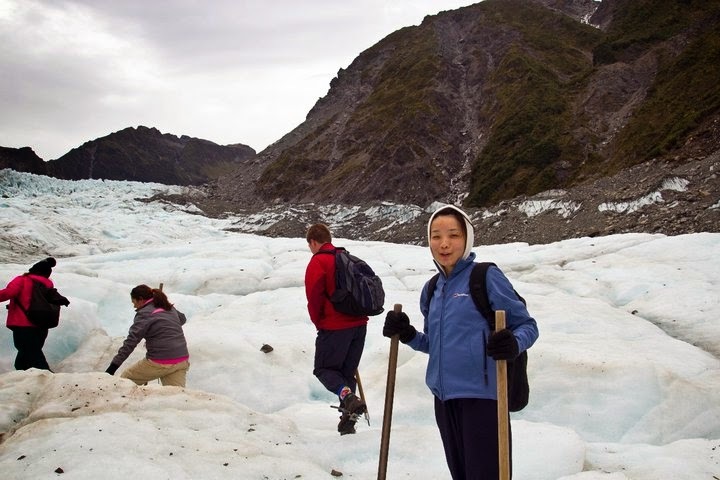 I noticed the pictures they have taken are nicer than me as the "blue point" at the Franz Josef glacier is really scenic. 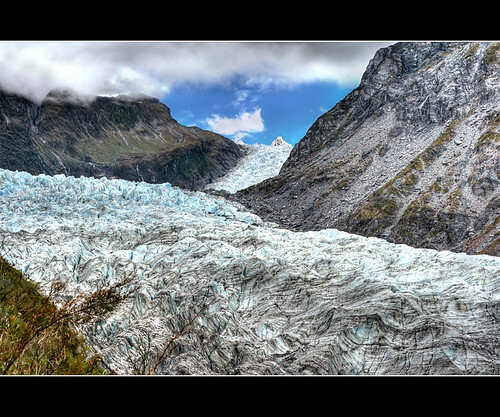 To me, I will go Franz Josef to have a photography if got chance. See my article for the comparison between FOX and Franz Josef, click here. For your advice, try to do a full day hiking instead of half day or even shorter as you will see more/special in the full day tour, is worth!!! may i ask, if the weather is bad and the trip cancel, will full refund? Yes, may be cancelled if under bad weather. And sure FOX will refund back to you in full. Before you attend the activity, you better check the weather in advance 2-3 days, then you may adjust your itinerary if bad weather. 你是去FOX 还是 FJ？ Full Day tour?